Launched in August 2013, we became one of only 25 environmental and sustainability initiatives in the UK to be awarded funding from the National Union of Students’ ‘Student Green Fund’. Stu Brew was set up through Student Community Action Newcastle (SCAN) and is now part of Go Volunteer. All sales profits are invested back into training and development for students and overall long-term sustainability of the enterprise. Our original 2.5BBL facility was installed in August 2014 with the first brew being 16th November 2014. In June 2018 we expanded the capacity of the brewhouse to 6BBL. We also have a 20L experimental kit for recipe design and small-scale brews. 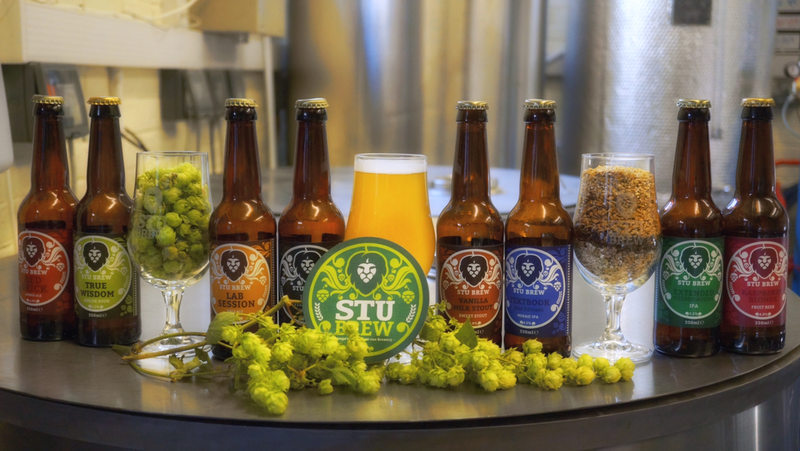 Set up with sustainability at heart, hops are grown on the student allotments and the brewing process uses a hot water recovery system to make the process more energy efficient. We send spent malt to a local farmer for use as animal feed and hop residue gets composted on the allotments. We have established a partnership with the School of Engineering and act as a research unit for sustainable brewery design, seeking to become an example of good environmental practice in the brewing field. We work closely with academics from the school and other local microbreweries in the North East to improve our process and share best practice.